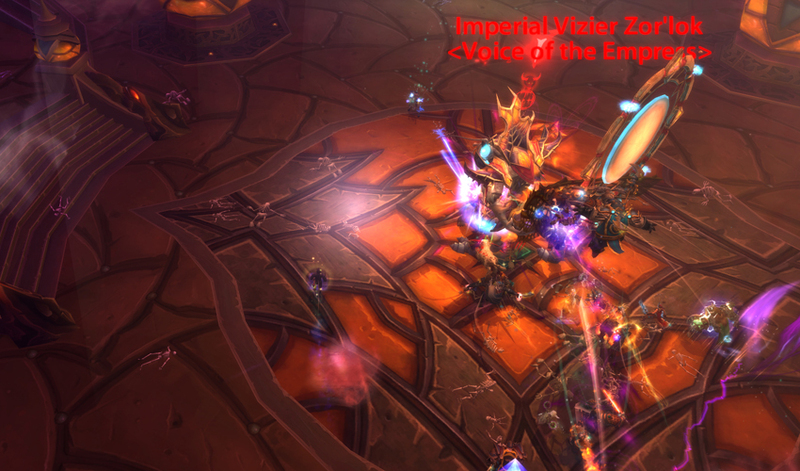 After a string of (almost) endless trash, you’ll end up in the first chamber with Vizier Zor’lok. Like Spirit Kings, the abilities and attacks he gain will vary on every pull. When running from platform to platform through the Pheromones of Zeal, you will be unable to cast spells due to the silence. Before you enter the gaseous areas, apply any HoTs and absorbs as you move. Use speed increasing abilities to get through the Pheromones quicker (Stampeding Roar, Body and Soul, etc). Attenuation (North east platform) is an easy mechanic to get through. Switch your camera to a top down perspective. You’ll notice a distinct pattern where the rings are emitted in a spiral pattern in a clockwise or counter-clockwise fashion. Avoid standing at the far back as each ring will bounce once off the back wall. Standing too close leaves you too little time to react. Tip: Hold down your right mouse button and strafe left or right while trying to maintain the Vizier in the center of your screen. Strafing is the key to surviving. Force and Verve can be easily handled when players duck into Noise Cancelling bubbles. The damage is reduced by 40%. Average raid DPS during this phase means you should experience 2 sets of Force and Verve. Use 2-3 raid wide cooldowns to help relieve the healing. Assign the melee/tanks to one bubble (the closest, the healers to another bubble (the middle), and the ranged DPS to the final (the furthest). Any extra DPS can be balanced by assigning them individually to the healer bubble. We stacked up at one point behind the tank during the Convert platform (Mind Control). Refrain from using DoTs. In addition, try to ensure your big spells and CC spells are on cooldown. I found out how annoying it is to randomly Psychic Scream my group. Heroism is used defensively on phase 2 during the first Force and Verve. Faster healing spells from the healers should be enough to keep players alive through this. Any additional cooldowns should be rotated through accordingly for the remaining ones. You should get 3-4 Force and Verve from 40% to 0.